Echinacea purpurea 'Ruby Star', Rudbeckia echinacea purpurea 'Rubinstern', Rudbeckia purpurea 'Rubinstern', Rudbeckia echinacea purpurea 'Ruby Star' and Rudbeckia purpurea 'Ruby Star'. Purple cone flower 'Rubinstern', black samson 'Rubinstern', eastern purple coneflower 'Rubinstern', hedgehog cone flower 'Rubinstern', purple daisy 'Rubinstern' and purple rudbeckia 'Rubinstern'. Flowers from August until October. Happy in sandy, loam or chalk soil of any pH. Prefers a humus-rich soil. Happy in any aspect except north facing and both exposed and sheltered sites. The daisy-like flowers bloom at the ends of tall stalks which are arranged with mid to light green leaves. The central ‘cone’ of each flower is covered with tiny, deep red/brown disc-florets. The surrounding, petal-like, ray-florets are a striking pink colour. A great plant for splashes of colour in beds or borders, suiting both cottage style and more modern planting schemes. It also works in prairie style planting schemes and its attractiveness to bees, butterflies and birds (the latter feeding on the seeds over winter) makes it perfect for wildlife gardening. The flowers and seedheads are also useful as cut flowers, both fresh and dried. If growing in an exposed spot, provide support for the plant as it starts to develop in the late spring. Keep the area weed free as Echinacea plants suffer if they have too much competition. Deadhead by cutting flowered stems down to a joint (ie a node) to encourage further flowering. Once flowering has finished the plant can be cut down to ground level, however we recommend that you leave the attractive seedheads on the plants for winter interest and to provide a source of food for birds. They can then be cut down in early spring or when they look too scruffy to be retained. In spring you can divide clumps or sow seeds (at 15°C). Take care not to disturb the plants too frequently for division as they don’t respond well to this and will take some time to re-establish. As this is a cultivar it may not come true from collected seeds. Root cuttings can be taken in the winter. Generally Echincea purpurea plants are problem free and are rarely seriously affected by pests or diseases. You may find that you have the occasional problem with aphids, leafhoppers and Japanese beetles. The plants may also contract fusarium wilt, powdery mildew or leaf spots. The aster yellows virus can also be transmitted to Echinacea, usually transferred by a vector such as leafhoppers. 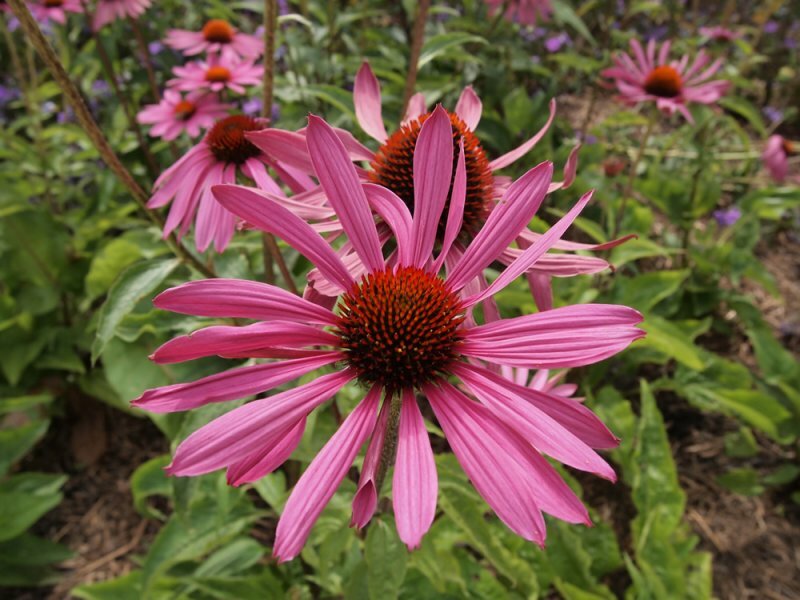 This Echinacea purpurea variety has been given the Award of Garden Merit by the RHS. It was developed by the Jelitto company in Germany, hence the German cultivar name ‘Rubinstern’, which translates as ‘Ruby Star’. The genus name Echinacea derives from the Greek ‘echinos’, meaning hedgehog, referring to the prickly central cone of the flower. 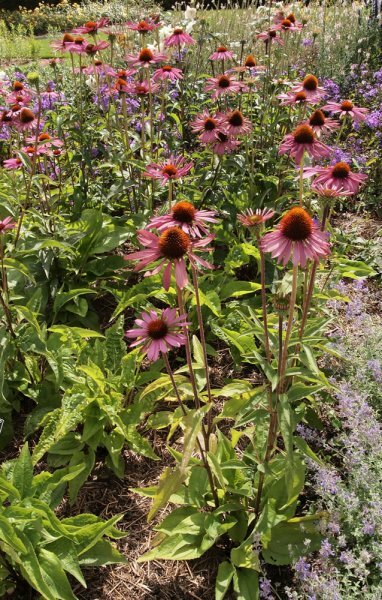 Native Americans used Echinacea as a ‘cure-all’ and to treat wounds. 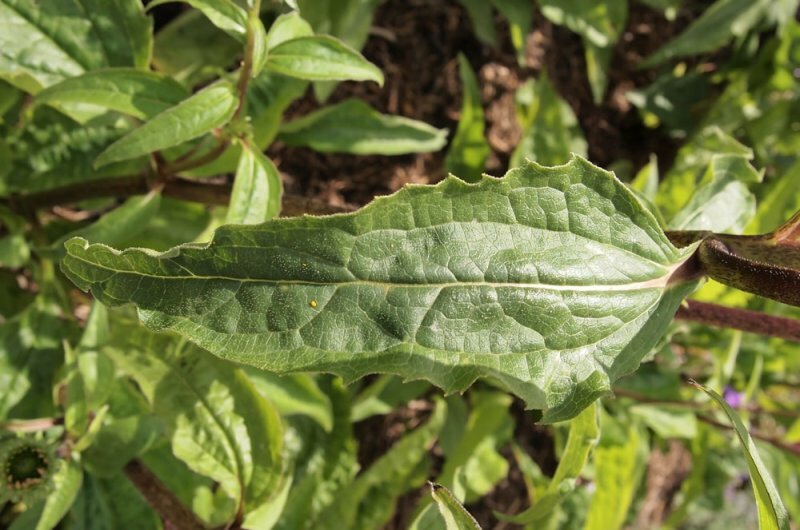 The medicinal use of the plant has continued and it is often used today to treat conditions such as skin diseases, fungal infections, gangrene, boils, slow-healing wounds, upper respiratory tract infections, herpes and acne. It is commonly sold as an immune system booster to ward off coughs and colds. Excessive ingestion may cause throat irritation.